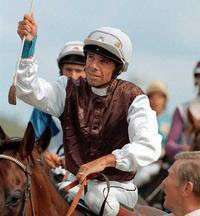 Gary Grylls, jockey, landed 1,252 winners during a 28-year career & retired as the 13th most successful jockey in NZ racing history. His NZ Group One winners include Kerry Lane (Auckland Cup), Sound The Alarm (Railway Handicap) & Ballroom Babe. Gary rode Kerry Lane to win the 1986 Auckland Cup. He won the Easter Handicap, aboard Cosmetique in 1986. Gary twice won the Ellerslie Sires' Produce Stakes, the forerunner to the Diamond Stakes, on Ballroom Babe in 1995 and Winged Foot in 2000.